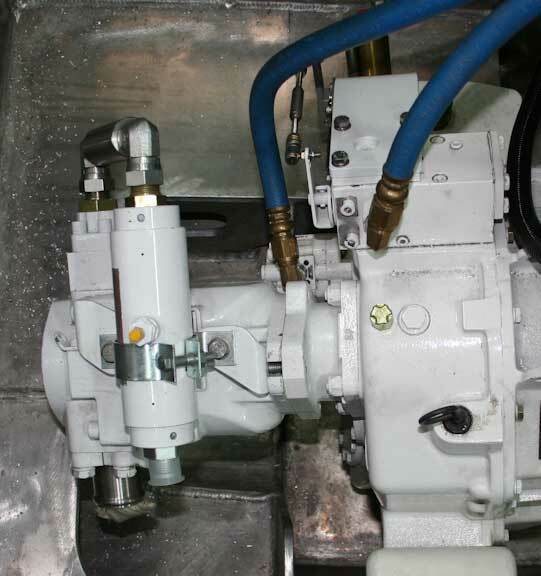 Lots more to share this week, starting with the hydraulic system pulsation dampener (the pipe shaped device mounted on top of the hydraulic pump). 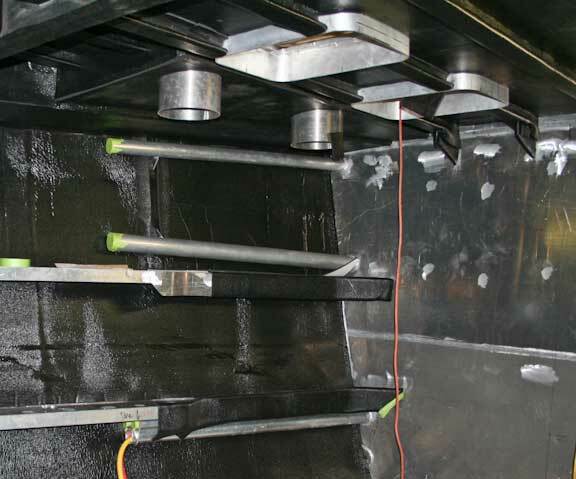 We use these to reduce hydraulic noise. 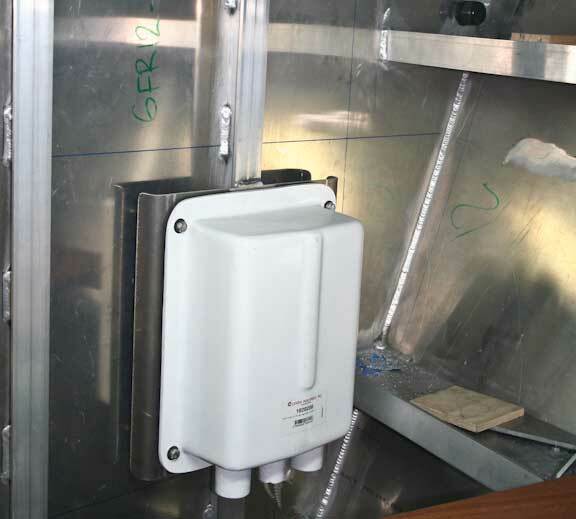 A water separator for the genset exhaust. Note the lovely bent and welded aluminum bracket. You will see these throughout the boat. Preliminary layout for fresh water pressure pumps and accumulator tank. We are fitting two pressure pumps, one for each tank. This makes it easy to decide which tank to use (no valves, just a selector switch) and the second pump is a built in back up. In laying out all of this gear the primary requirement is easy of maintenance. And if you run a tank dry the second pump is primed and ready to go (especially important if you are taking a lovely long shower on a cold night). There are individual pumps for each air conditioning compressor. 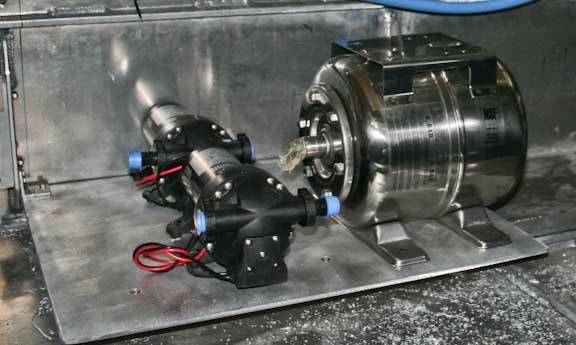 This increase reliability (if you lose a pump only that compressor is affected) and uses less power. This nondescript photo is of the hydraulic oil cooling tank. Rather than heat exchangers and complex plumbing for cooling water we are using a simple hull tank for cooling the hydraulic oil. Preliminary layout for alternator rectifier assemblies. 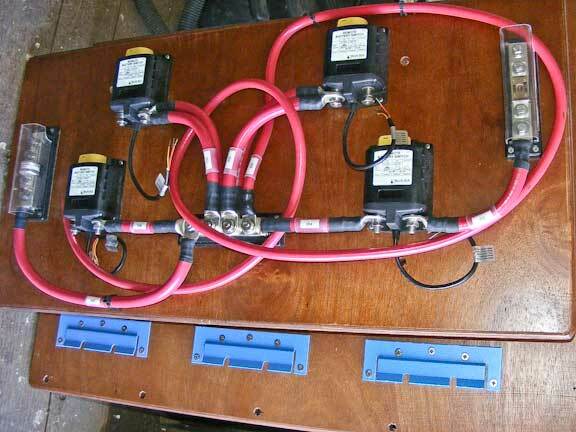 These are remotely mounted, away from the alternator casings, to better distribute the heat build up. The output of the alternators is fused after the rectifier assembly. Basic assembly of high load DC system. 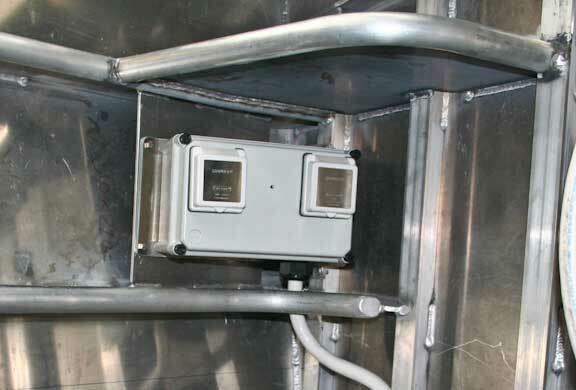 A junction box for electrical connections to the forward mast in the forepeak. And the junction box and connection points for shore power. It is protected from drips by the step above it. 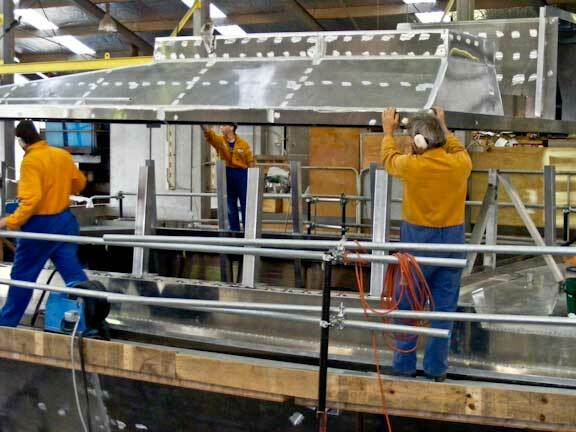 Hull number one is now being insulated with Armaflex. 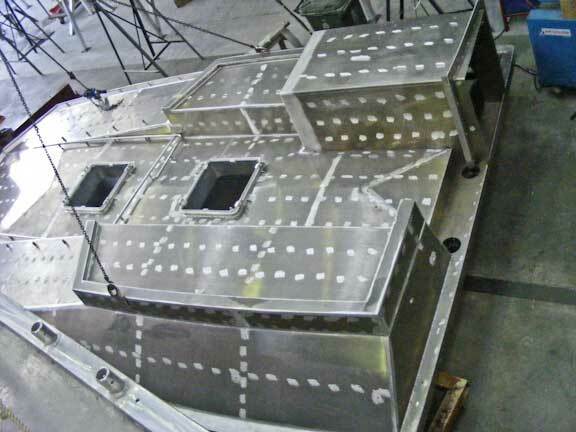 Note that the topsides, deck, and stiffeners are being covered. 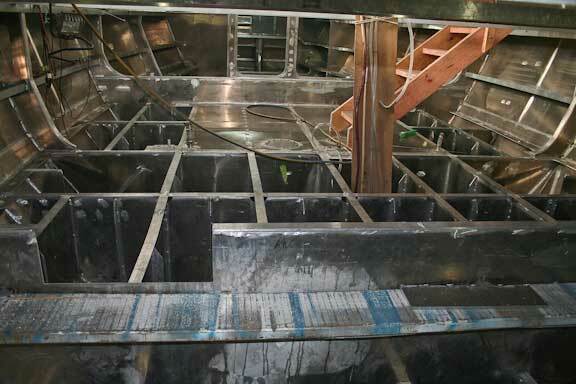 This photo is of the area outboard of the forward shower compartment. The three pipes shown are conduits for wiring. 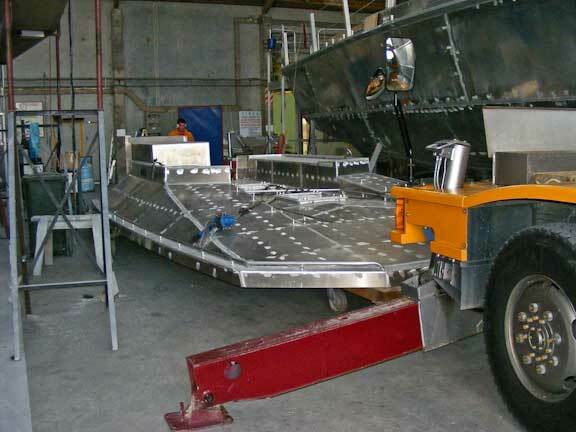 Looking at the fuel tank area on hull number two. The aft center tanks are now closed off. The rest will soon have their tops welded. 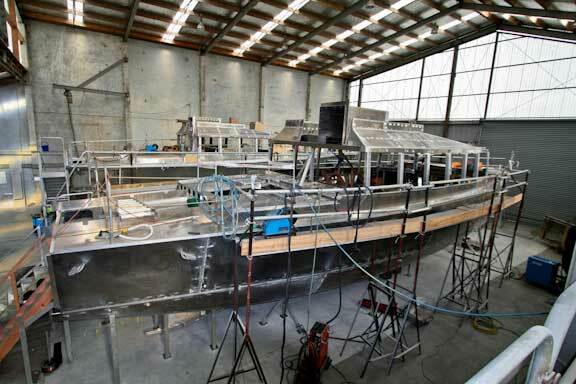 Finally some shots showing the roof going onto the saloon of hull number two. This has been prefabricated on a building jig in another section of the shop. 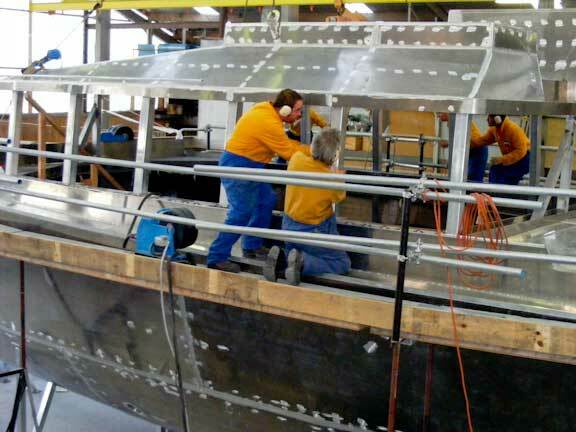 As we have discussed previously, these mullions are welded at the coaming top, deck, and to the first topside stronger. 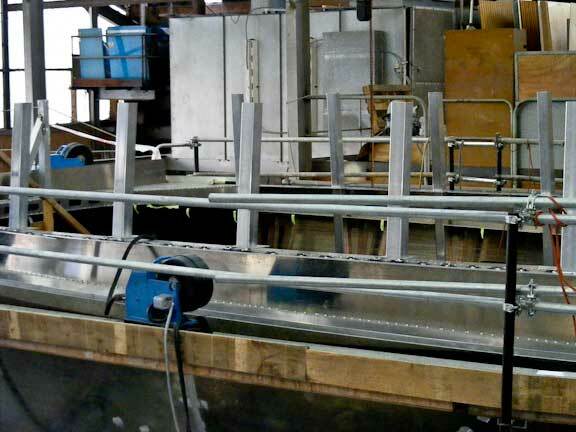 The creates an enormously strong bond beam. The roof assembly being guided into place. 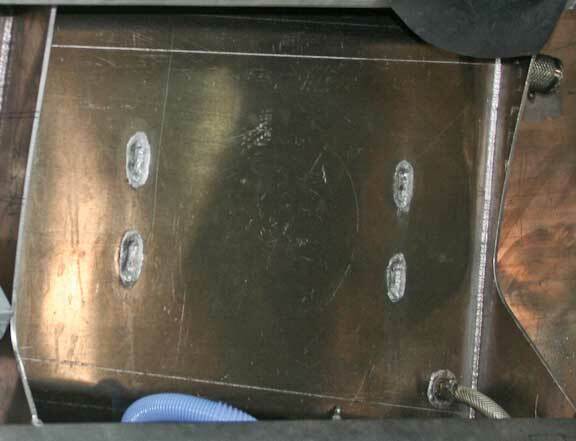 Ah, it fits…Time to start welding. This entry was posted on Thursday, May 7th, 2009 at 8:05 pm and is filed under FPB 64 Updates. Both comments and pings are currently closed. 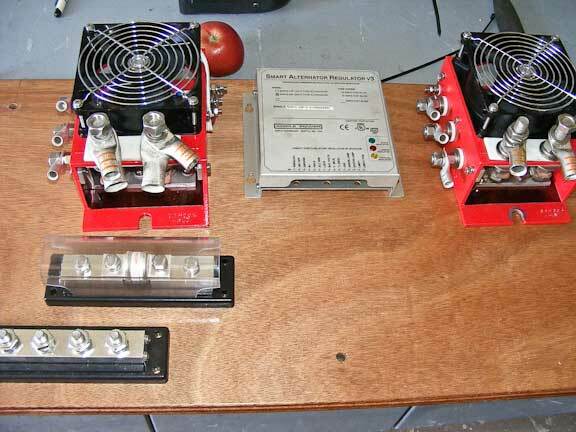 Who makes the remote rectifier assembly? The alternators with remote diode assemblies come from Electrodyne in Scarborough, Maine.